Sir John Richard Hicks (April 8, 1904 – May 20, 1989) was a British economist, one of the most influential economists of the twentieth century. He contributed to the field of economics with his IS/LM model, which summarized the Keynesian view of macroeconomics in graphical form. He also introduced the idea of elasticity of substitution, which showed that labor-saving technical progress does not reduce labor's share of income. In his book, Value and Capital, one of the first works on general equilibrium theory, Hicks showed that value could be understood without having to quantify utility. He also contributed to welfare economics, developing a way to compare the impact of different policies, regarding the one that produced sufficient gain to compensate for any losses and still provide benefit to be worthy of implementation. Hicks was not a follower of a particular school of economics, but rather took an eclectic approach, reviving and further developing the best of each school. Thus, his work was an attempt to better understand all types of economic forces and to be better able to establish an economically stable human society, benefiting all people. In 1972, Hicks was awarded the Nobel Prize in Economics, together with Kenneth J. Arrow, for his contributions to general economic equilibrium theory and welfare theory. John Richard Hicks was born in Leamington Spa, Warwickshire, England, the son of a journalist. He was educated at Clifton College (1917-1922) and later received a mathematical scholarship to study at Balliol College, at the University of Oxford, where he enrolled in 1923. Although initially specializing in mathematics, Hicks was not content and had a strong interest in literature and history. He transferred in 1923 to the newly opened School of Philosophy, Politics and Economics. However, he did not have adequate qualification in any of the subjects that he studied, and graduated with a second-class degree. In the 1920s, economists were very scarce and so Hicks picked up a temporary lectureship at the London School of Economics, which was then continued. He started as a labor economist, doing descriptive work on industrial relations, but gradually moved over to the analytical side. He discovered that his knowledge of mathematics, by that time almost forgotten, could be revived, and was sufficient to cope with what anyone used in economics. In 1935, Hicks married fellow economist, Ursula Webb. At that time he transferred to Cambridge University where he became a lecturer in economics. During his three years in Cambridge, Hicks completed his significant book, Value and Capital, which was based on the work he had done in London. He was also a fellow of Gonville and Caius College, at Cambridge, from 1935 to 1938. In 1938, Hicks became professor at the University of Manchester. It was there that he started to focus mainly on welfare economics, and its application to social accounting. In 1946, he returned to Oxford, first as a research fellow of Nuffield College (1946-1952), then as Drummond Professor of Political Economy (1952-1965), and finally as a research fellow of All Souls College (1965-1971). Hicks became a fellow of the British Academy in 1942; a foreign member of the Royal Swedish Academy in 1948, of the Accademia dei Lincei, Italy, in 1952, and of the American Academy in 1958. He was knighted in 1964. He received honorary doctor degrees from several British Universities—Glasgow, Manchester, Leicester, East Anglia, and Warwick—as well as of the Technical University of Lisbon, Portugal. In 1972, Hicks received the Nobel Prize in Economics, together with Kenneth J. Arrow, for his work on general economic equilibrium theory and welfare theory. John Hicks died on May 20, 1989 in Blockley, Gloucestershire, Great Britain. Hicks' early work was as a labor economist culminated in The Theory of Wages (1932), still considered a standard in the field. In that book he gave his own interpretation of marginal productivity theory, attempting to reinvoke interest in it. In the book he also introduced his famous "elasticity of substitution" which is defined as “the elasticity of the ratio of two inputs to a production (or utility) function with respect to the ratio of their marginal products (or utilities).” Using this, Hicks was able to show that, contrary to Karl Marx's analysis, labor-saving technical progress does not necessarily reduce labor's share of national income. In the mid-1930s, Hicks worked on a way to unite various theories of imperfect competition, introducing the concept of "conjectural variations." He also attempted to resurrect the Lausanne School of economics developed by Léon Walras and Vilfredo Pareto. The central feature of the Lausanne School was its development of general equilibrium theory, and he attempted to introduce this to the English-speaking world. In 1934, he tried to do the same with his review of Gunnar Myrdal's work, which drew attention to the Stockholm School of economics. His magnum opus was Value and Capital, published in 1939. This book built upon ordinal utility and mainstreamed the now-standard distinction in demand theory between the substitution effect and the income effect for an individual for the case of two consumer goods. It generalized analysis to the case of one consumer good and a composite good, that is, all other goods. It also aggregated individuals and businesses through demand and supply across the economy, anticipating the aggregation problem most acutely for the stock of capital goods. Pareto improvements are a small subset of Kaldor-Hicks improvements. Hicks' book introduced general equilibrium theory to an English-speaking audience, refined the theory for dynamic analysis, and for the first time attempted a rigorous statement of stability conditions for general equilibrium. In the course of analysis Hicks formalized comparative statics. In the same year, he also developed the famous "compensation" criteria, called the Kaldor-Hicks efficiency, for welfare comparisons of alternative public policies or economic states. In essence, Hicks suggested the criterion that would judge an outcome to be preferable if those who gain by the measure would still gain if they had to compensate those who would lose. Based on this compensation criterion, policies could be compared and the one leading to the greatest net benefit would be implemented. Under Pareto efficiency (developed by Vilfredo Pareto), an outcome is more efficient if at least one person is made better off and nobody is made worse off. This seems a reasonable way to determine whether an outcome is efficient or not. However, some believe that in practice it is almost impossible to make any large change such as an economic policy change without making at least one person worse off. Under ideal conditions, exchanges are Pareto efficient since individuals would not voluntarily entered into them unless they were mutually beneficial. Using Kaldor-Hicks efficiency, an outcome is more efficient if those that are made better off could "in theory" compensate those that are made worse off and lead to a Pareto optimal outcome. Thus, a more efficient outcome can in fact leave some people worse off. The criterion is used because it is argued that it is justifiable for society as a whole to be better off, even though it involves making some worse off if this means a greater gain for others. Hicks' most familiar contribution to macroeconomics was the Hicks-Hansen IS-LM model, which formalized the theory of John Maynard Keynes. The model describes the economy as a balance between three commodities: money, consumption, and investment. 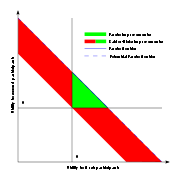 It can be presented as a graph of two intersecting lines in the first quadrant. The IS curve moves to the right, causing higher interest rates and expansion in the "real" economy (real GDP). 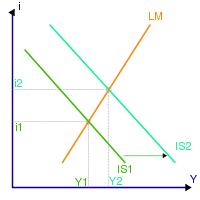 The horizontal axis represents national income or real gross domestic product and is labelled Y. The vertical axis represents the real interest rate, i. The IS schedule is drawn as a downward-sloping curve. The initials IS stand for "Investment/Saving equilibrium," but since 1937 they have been used to represent the locus of all equilibria where total spending (Consumer spending + planned private Investment + Government purchases + net exports) equals an economy's total output (equivalent to income, Y, or GDP). The level of real GDP (Y) is determined along this line for each interest rate. The LM schedule is an upward-sloping curve representing the role of finance and money. The initials LM stand for "Liquidity preference/Money supply equilibrium" but is easier to understand as the equilibrium of the demand to hold money as an asset and the supply of money by banks and the central bank. The interest rate is determined along this line for each level of real GDP. The Hicks-Hansen model illustrates graphically Keynes' conclusion that an economy can be in equilibrium with less than 100 percent employment. This model eventually became the starting point of the Neo-Keynesian synthesis in economic systems which dominated in the mid-twentieth century. It later came under criticism in the early 1970s, when high inflation and growing unemployment seemed to be incompatible with the predictions of the system. In one of his later works, published in 1980, Hicks criticized his own model, asserting it had omitted some crucial components of Keynes' arguments, especially those related to uncertainty. Among his other contributions to macroeconomics is the concept of "liquidity trap"—which happens in a stagnant economy, when the nominal interest rate is close or equal to zero, and when people start to keep their savings only in short-term bank accounts, expecting a recession. He also developed the concept of "temporary equilibrium," enlarged the "Linear Theory" and elaborated on the von Neumann turnpike. In the 1970s, Hicks worked to resurrect the Austrian school of economics, attempting to formalize the Austrian theory of capital which included both fixed and circulating capital. John Richard Hicks was one of the most important and influential economists of the twentieth century. He broke with Marshallian tradition that dominated the English-speaking world in the 1930s, in what is commonly known as “Paretian revival,” and reintroduced the theories of Leon Walras, the Austrian school, and the Swedish school based on the work of Gunnar Myrdal and Bertil Ohlin. His work, together with other great economic thinkers such as Paul Samuelson, Oskar Lange, Abba Lerner, Maurice Allais, and Harold Hotellin, helped consolidate the Marginalist revolution, which started some 50 years before. In many ways, Hicks' work is the standard of how economics should be done: without partisanship for favored theories but learning from all, constantly searching for new ideas and staying attached to none, and his own most severe critic. Although his work was deep enough, and his influence strong enough to form a school of thought, Hicks never gathered any great number of followers. The reason for this is probably that his approach was critical and eclectic, building upon every school that had something to offer. He did, however, inspire generations of thinkers, especially in the neo-Walrasian tradition, including Michio Morishima, Frank H. Hahn, and Takashi Negishi. Hicks, John R. 1932. The Theory of Wages. London: Macmillan. Hicks, John R. 1939. "The Foundations of Welfare Economics." Economic Journal, 69, 696-712. Hicks, John R. 1940. "The Valuation of Social Income." Economica, 7, 105-24. Hicks, John R. 1941. "The Rehabilitation of Consumers' Surplus." Review of Economic Studies, 8, 108-16. Hicks, John R. 1959. Essays in World Economics. Oxford: Clarendon. Hicks, John R. 1965. Capital and Growth. Oxford: Clarendon. Hicks, John R. 1975. "The Scope and Status of Welfare Economics." Oxford Economics Papers, Vol. 27, No. 3, 307-26. Hicks, John R. 1983. Classics and Moderns: Vol. III of Collected Essays in Economic Theory. Harvard University Press. ISBN 0674137434. Bliss, Christopher. 1987. "Hicks, John Richard." in The New Palgrave: A Dictionary of Economics. edited by Milgate, Murray, and Peter Newman John Eatwell. Vol. 2. 641-46. Macmillan. Autobiography of John Richard Hicks. NobelPrize.org. Retrieved on June 16, 2007. All links retrieved May 22, 2018. Autobiography – Hicks’s autobiography from 1992. Biography of John R. Hicks (1904-1989) – The Concise Encyclopedia of Economics. The Mainspring of Economic Growth – Hicks’s Nobel Prize lecture from 1973. History of "John Richard Hicks"
This page was last modified on 22 May 2018, at 15:00.